Wood you take me home? 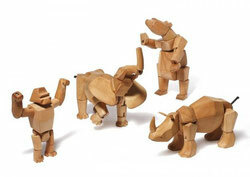 These beechwood, unstained creatures bring a bit of animal fun into your world. they are flexible enough to fit into any environment. What's up to all, how is all, I think every one is getting more from this site, and your views are pleasant designed for new viewers. There is certainly a great deal to know about this issue. I love all the points you've made. Oh my goodness! Incredible article dude! Many thanks, However I am experiencing problems with your RSS. I don't understand the reason why I can't join it. Is there anybody else getting identical RSS issues? Anybody who knows the answer will you kindly respond? Thanks!! It's awesome to pay a quick visit this web site and reading the views of all colleagues regarding this piece of writing, while I am also keen of getting familiarity. It's going to be ending of mine day, but before finish I am reading this wonderful paragraph to increase my knowledge. I'm impressed, I have to admit. Rarely do I come across a blog that's both educative and engaging, and without a doubt, you've hit the nail on the head. The problem is an issue that not enough people are speaking intelligently about. I am very happy I found this in my search for something concerning this.